A high quality, reliable and economically priced charge controller from Morningstar. Features their advanced PWM pulse charging algorithm and Low Voltage Disconnect. Other features include selectable battery type and temperature compensation. 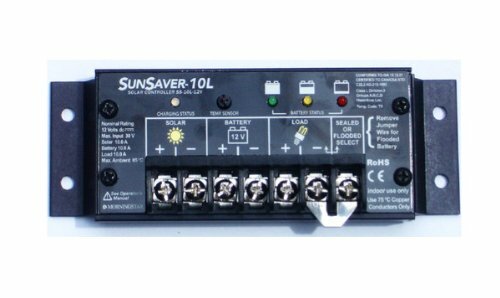 Specifications: Model #: SS-10L-12V LVD (low voltage disconnect): Yes Vdc (voltage direct current): 12 V Solar Amps: 10 A Load Amps: 10 A Weight: 1 lb. / .45 kg Dimensions: 5.9" x 2.1" x 1.3" / 149.86 x 53.4 x 33.02 mm Warranty info: 5 year warranty from manufacturer Shipping wt. 2 lbs. If you have any questions about this product by Morningstar, contact us by completing and submitting the form below. If you are looking for a specif part number, please include it with your message.